Prices of Huawei P30 and P30 Pro leaked online ahead of March 26 launch. Ahead of their launch on March 26, the prices of Huawei P30 and P30 Pro smartphones have leaked online. According to WinFuture, the Huawei P30 phone will be available in the European market at a price of 749 Euros (around Rs 58,645) while the Huawei P30 Pro variant comprising of 8GB RAM and 128GB internal memory will sell at 999 Euros (around Rs 78,220). The other variant of P30 Pro, which has 8GB RAM and 256GB internal memory will be priced at 1,099 Euros (around Rs 86,050). 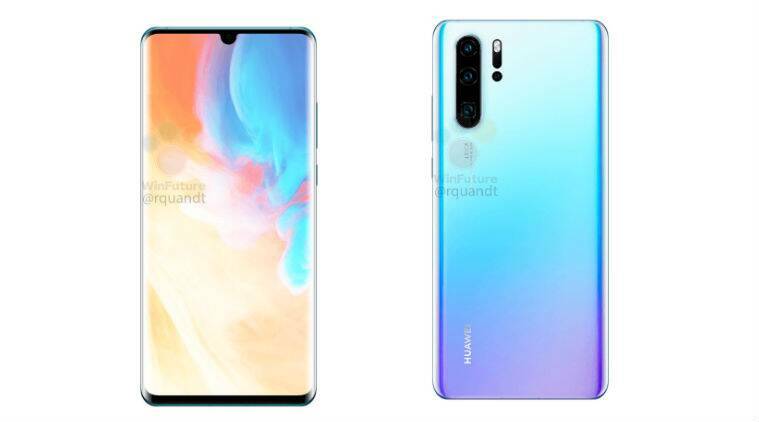 Huawei P30 Pro will have a 6.47-inch OLED display with a resolution of 2340 x 1080 pixels. The screen will have a small teardrop notch on top. The display edges are curved, similar to Samsung S10+. Huawei P30 Pro will have an in-display fingerprint sensor. The device will support facial recognition for unlocking the phone, however, 3D sensor technology like predecessor P20 Pro will not be there. The cameras will be the highlight of P30 Pro. The phone will have four Leica-branded sensors at the back – 40MP primary camera with f / 1.6 aperture and OIS, 20MP secondary wide-angle sensor with f/2.2 aperture, a third 8MP camera with f/3.4 aperture and a fourth Time of Flight camera with 10x hybrid zoom. The phone will be powered by octa-core Kirin 980 processor, with a clock speed of up to 2.6GHz, coupled with 8GB RAM and 128GB or 256GB storage options. The memory will be expandable via Huawei’s own NanoMemory card that was introduced on last year’s flagship. Huawei P30 will be available with a smaller screen, battery and triple rear cameras. The processor, front 32MP camera will remain the same as P30 Pro. The phone also runs Android 9.0 Pie with EMUI 9.1 skin. According to the report, Huawei P30 sports a 6.1-inch OLED screen with a resolution of 2340 x 1080 pixels. A dewdrop notch will include the earpiece and the camera and there is no dual curved display.